In the last of three articles concerning client care letters (CCLs), CILEx Regulation’s consumer engagement and policy officer, Sue Chandler, explains why CCLs are a great opportunity to win over your client. 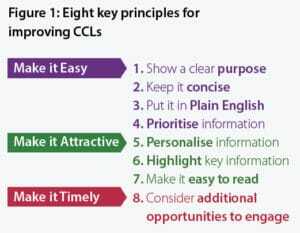 The research provides eight key principles to follow when preparing a CCL (see Figure 1). The principles have been built taking account of the EAST framework developed by the behavioural insight team. The framework describes four general principles that should be used to encourage engagement: make it Easy, Attractive, Social and Timely.2 We look at principles 6, 7 and 8 in this article. Simplify navigation through your CCL by making key information straightforward to pick out. listing content, for example, displaying a complaints procedure as a staged process; and using subheadings throughout, so content of greater relevance can be quickly identified. Use a font size of at least 12: This is more inviting to read. Individuals with visual impairments find a small font size a fundamental barrier. Prepare short paragraphs: Dense text is often skim read, or ignored, leading to vital details being missed. a staged process for complex content (see Figure 3 below). Separating out information: Remove generic information from the CCL by providing it in leaflets and signposting to the leaflet in the CCL. 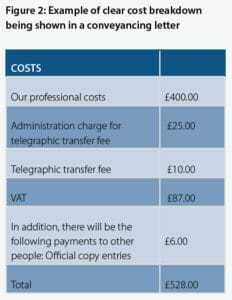 Avoid the dangers leading from your client discarding the leaflet by e-mailing a copy later. Sending reminders: Clients are more receptive to certain information as the case progresses. 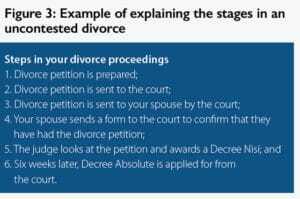 Details such as your complaints process may be more relevant once the case is underway, and particularly closer to completion when clients are more aware of the service they have received. 1 Research into Client Care Letters: qualitative research report, available here. 2 EAST: Four simple ways to apply behavioural insights, available here.